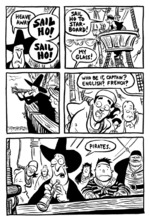 Blending real historical facts and humor based comics into something provocative and highly entertaining is no feat. Join Chris Schweizer (Crogan’s )as he leads the discussion with Ben Towle (Amelia Earhart), Becky Cloonan(Northlanders) and Don Rosa (Uncle Scrooge) as they explain the intricacies of the creative juggling act. This panel episode also includes a short HeroesCon recap and a little introduction to the Dollar Bin and the panel release schedule.